The following instructions are presented here for reference. Removal and disassembly of the compressor is not recommended unless the appropriate service parts and/or kits are on hand. These instructions are general and are intended to be a guide, in some cases additional preparations and precautions are necessary. 1. Block the wheels of the vehicle and drain the air pressure from all the reservoirs in the system. 2. Drain the engine cooling system and the cylinder head of the compressor. Identify and disconnect all air, water and oil lines leading to and from the compressor. 3. 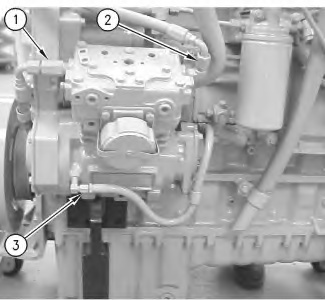 Remove the governor and any supporting brackets attached to the compressor and note their positions on the compressor to aid in reassembly. 4. 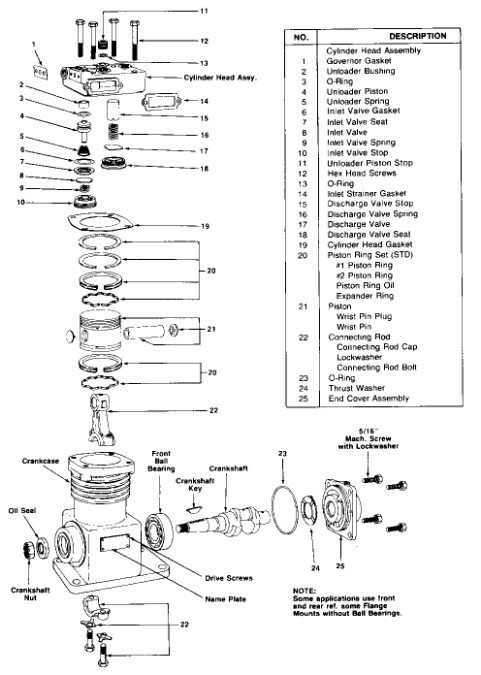 Remove the discharge port and inlet cavity fittings, if applicable, and note their position on the compressor to aid in reassembly. 5. Remove the flange or base mounting bolts and remove the compressor from the vehicle. 6. Remove the drive gear(s) or pulley from the compressor crankshaft using a gear puller. Inspect the pulley or gear and associated parts for visible wear or damage. Since these parts are precision fitted, they must be replaced if they are worn or damaged.